Dry period, special needs cows and treatments brings together all the practical information about the most important period in the cow's lactation cycle, the group of cows that require most attention and the jobs that have the greatest impact on the health, welfare, production and job satisfaction of cow and farmer. Eighty per cent of the time a farmer spends directly on his cows goes on twenty per cent of his herd. This twenty per cent consists of special needs cows - dry cows, new heifers, newly calved cows, lame cows, weak cows and sick cows. Targeting this work efficiently saves a lot of time and makes the farmer's work much more enjoyable. Dry period, special needs cows and treatments discusses how to go about all these aspects in practice. 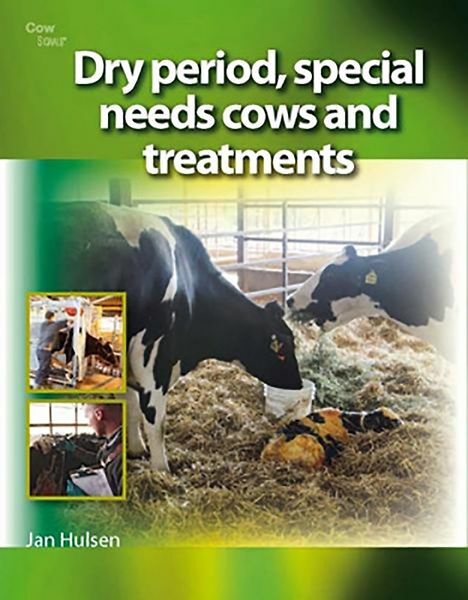 Written in a practical way, Dry period, special needs cows and treatments explains how to guide the cows through a healthy and problem-free dry period, calving, and start of lactation. The outcome: more milk and far fewer problems, because seventy-five per cent of health problems occur in the first month after calving. 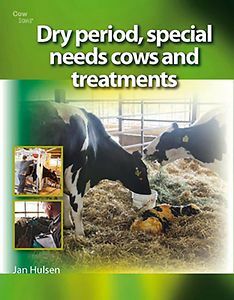 Dry period, special needs cows and treatments also explains how to organise and implement actions and treatments. So that your cows and heifers stay healthy or recover fast. And so that you, the farmer, can work safely and get plenty of job satisfaction every day. Author Jan Hulsen is known for his highly practical and easy to read books, which are famed for the masses of excellent information they provide. Just like earlier editions in the Cow Signals series, this book is bursting with photographs, practical examples, fabulous illustrations and look-think-act pictures designed to challenge and educate the reader.